In the bestselling tradition of Cheryl Strayed’s Wild and Helen MacDonald’s H Is for Hawk, Karen Auvinen, an award-winning poet, ventures into the wilderness to seek answers to life’s big questions with “candor [and] admirable courage” (Christian Science Monitor). Determined to live an independent life on her own terms, Karen Auvinen flees to a primitive cabin in the Rockies to live in solitude as a writer and to embrace all the beauty and brutality nature has to offer. When a fire incinerates every word she has ever written and all of her possessions—except for her beloved dog Elvis, her truck, and a few singed artifacts—Karen embarks on a heroic journey to reconcile her desire to be alone with her need for community. In the evocative spirit of works by Annie Dillard, Gretel Ehrlich, and Terry Tempest Williams, Karen’s “beautiful, contemplative…breathtaking [debut] memoir honors the wildness of the Rockies” (Publishers Weekly, starred review). 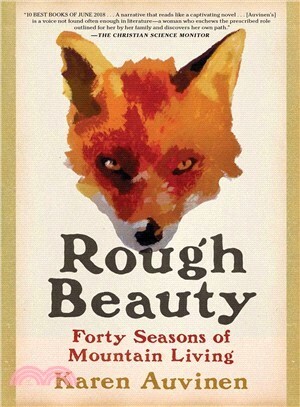 “Rough Beauty offers a glimpse into a life that’s pared down to its essentials, open to unexpected, even profound, change” (Brevity Magazine), and Karen’s pursuit of solace and salvation through shedding trivial ties and living in close harmony with nature, along with her account of finding community and even love, is sure to resonate with all of us who long for meaning and deeper connection. An “outstanding…beautiful story of resilience” (Kirkus Reviews, starred review), Rough Beauty is a luminous, lyric exploration, “a narrative that reads like a captivating novel...a voice not found often enough in literature—a woman who eschews the prescribed role outlined for her by her family and discovers her own path” (Christian Science Monitor) to embrace the unpredictability and grace of living intimately with the forces of nature.